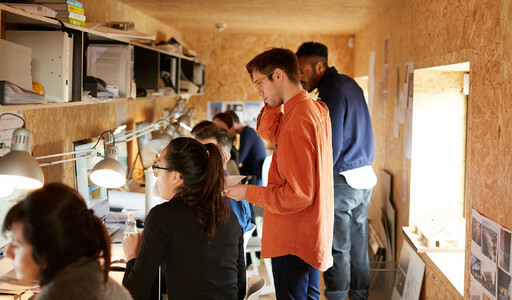 Behind the scenes at Pop Brixton, we have a community of creative startups and small businesses based in offices, workshops and studios. Join a community that includes everything from architects and a food club startup to social enterprises and events agencies. Built from upcycled shipping containers, these bright offices have glazed double doors and insulated windows, and are on the 2nd floor at Pop Brixton, with a private terrace and amazing views. These two offices are built from two separate 20ft shipping container, and provide space for a team of up to 8 members. They also benefit from free internet and a fully equipped kitchen.